This is the UK edition unabridged audiobook of The Dark Wind, published by Isis Audio Books, narrated by George Guidall onto six cassettes with a playing time of 8 hours. The cassettes are in a beige plastic case with dark blue cover insert. The cover illustration is by Kevin Feeney. 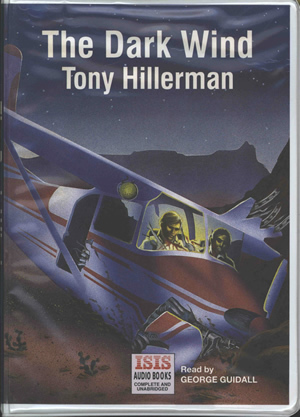 The front cover is a drawing of a small airplane crashed into a desert landscape, with two men in the cockpit. The back cover is dark blue and displays a photo and brief biography of George Guidall, a synopsis of the novel, and publication information.